I have been trying to keep up with what is going on at General Conference through Twitter. I have noticed that the words leadership and leader have started to appear. While the words leader and leadership are still very small on Andrew Conard’s Word Cloud for General Conference tweets, I imagine they will gain traction as the conference continues. Bishop Jones’ tweet that “My view – three most important factors in renewing the UMC: leadership, leadership, and leadership” sums up the problem with the whole tenor of General Conference and the work leading up to it from my perspective. The controversial Call to Action is epitome of the cult of leadership. Some seem to believe that if we just empower the leaders of our churches and lead in the right ways, “leadership, leadership, and leadership” will renew our church. The problem is that leadership is not the answer. People will not come to United Methodist churches because of leaders. When someone is “church shopping” the person is not going to go online and look at the official statistics to see who is leading best. A first time visitor to a church is not going to grill the pastor to see if they have read a book by Borden, Heifetz, Stanely, or whatever business or church leader is the newest savior. Visitors are not concerned with leadership. Unchurched people are not hoping that the churches suddenly have an influx of leaders. Our purpose as United Methodists is to make disciples of Jesus Christ for the transformation of the world. Leaders do not make disciples. God makes disciples. A disciple is one who follows. The initial invitation to follow comes from Jesus, not a leader. The grace to understand and accept the invitation to follow comes from the Triune God, not a leader. Churches can and should be part of God’s work, but churches need to remember it is God’s work. We follow Jesus, we invite others to follow Jesus, and we support each other by the grace of God on the journey. Leonard Sweet best captures this in his book I Am a Follower. As followers of Jesus, we might be a first follower, one who accepts Jesus call to follow and then invites others to follow as well. Leadership might play a role in following and inviting others to follow, but the heart of the matter is following, not leadership. We do not lead, we follow and invite others to do the same. I often hear people use Biblical leaders as justification for the importance of leadership. At a retreat I attended earlier in the year, a pastor who I greatly admire, used Jeremiah as an example of a leader. My question though is “who exactly did Jeremiah lead?” When I look at the Bible, I do not see leaders. I see followers who invited others to follow along. When Moses followed God and invited others to follow, great things happened. The reason Moses did not enter the Promised Land was not because he followed, its was because he tried to lead apart from following God. Joshua is often lifted up as a great leader, but the reality is that he followed God. Look at what happened at Ai when he tried to lead and not follow. David might have been a king after God’s own heart, but how well did David do when he tried to lead in terms of a census? Time and time again, the best examples of faith in the Bible are seen in followers, not leaders. Ruth was a follower. The prophets followed where God’s call on their lives led them. How often though did the people follow their leadership? Why we remember them today, why their words are God-breathed as the author of 2 Timothy might say, is that they faithfully followed God. Often the people of faith we admire the most, are the people least respected by the leaders of their day. No one would have accused most of the prophets of being a leader of the people. Too often they were trying to invite the people to turn away from their leaders and turn back to God. One reason we keep holding up leaders as the solution is that we fall into the fallacy that correlation equals causation. People look at “successful churches” and they often identify a leader. The success of that church, after the nominal nod to God, is then attributed to the leadership of the individual identified. The thinking goes something like this: we have a leader, we have a successful church, one must have caused the other. This is not inherently true. When I look at pastors who have helped churches thrive, I would not attribute it to leadership. Most of those pastors are passionate followers of Jesus who have invited others to follow. The congregations are full of passionate followers of Jesus who are inviting others to follow. What appears to be leadership is a successful partnership between the the followers and God. Jesus invites, the Triune God empowers and equips, the people accept the invitation to follow, and then go out and invite others to follow. Is leadership inherently bad? No. Can leadership be part of followership? Yes. My primary concern is how we are framing our conversation in the church today. We keep using words like accountability. Accountability is an important part of following Jesus, but in the wrong context it becomes deeply problematic. Holding people accountable for what they cannot control is flawed, but at the heart of how our society practices leadership. Accountability in the context of following Jesus is the genius of monasticism and the early Methodist movement. How we frame our conversation matters. The language of leadership should not be our default. If our focus is on leadership, we are going to fail. If our focus is on how Jesus is calling us to follow, by the grace of God we might thrive once more. General conference cannot mandate health. We cannot make people, congregations, or pastors follow Jesus. At the heart of following Jesus is prayer, repentance, and discernment. As a church and as followers, this has to be our starting place. General Conference could help shape our life together as a church in ways that encourage us to pray, repent, and discern. We might envision ways of being the church that help us better follow Jesus and invite others to follow as well. As a church we do not have to reinvent the wheel. The Bible is full of models of how to follow Jesus and invite others to follow. Our history as United Methodists and as Christians, is full examples of how the church could be shaped to better follow Jesus and invite others to follow. The focus though must be on followship, not leadership. 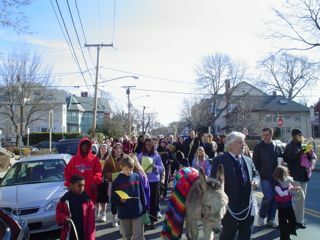 Palm Sunday 2007 in Somerville MA. Previous Previous post: Young Clergy?